We’ve said it again and again — Microsoft is turning the Xbox to more than just a gaming brand and into a massive entertainment entity. The next step in that phase has gone online and it’s called Xbox Music. Today we’ve got the skinny on services and pricing. Read on to find out more! Xbox Music will have services that should be familiar to anyone who’s used Spotify before. It will allow you to stream music for free but with ads on your device or have the ability to download it for a monthly fee. In Xbox Music’s case, having that privilege will require you sign up for an Xbox Music Pass and will cost you £8.99 a month or £89.99 per year (around $14 and $144, respectively). This fee will allow you to share your music across five different devices, including smartphones and tablets. Xbox Music will also have a download-to-own scheme with pricing “comparable to other services for songs and albums” and will allow you to get your songs in DRM-free MP3 format. In addition to this, the service will also have Smart DJ — a Pandora-like feature that gives you recommendations on other songs that you may like based on what you’ve been listening to. 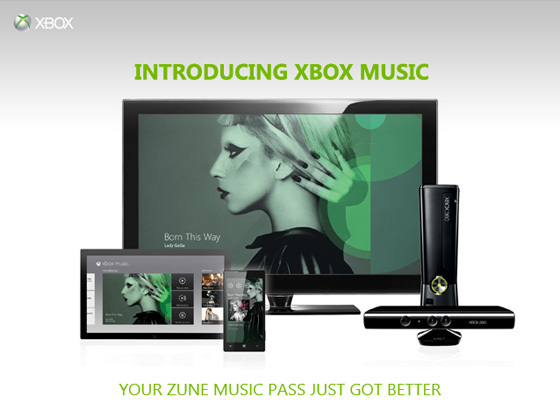 As you can see, Xbox Music is a lot like other music services that are already on the market. Their main advantage is that it utilizes your Windows Live ID and is backed by Microsoft, making sharing your songs and playlists between devices, especially those that run Windows, potentially less complicated. Are you excited to try out Xbox Music? How do you think it will rate against Spotify and iTunes? Discuss in the comments!